KRAFTWERK – BACK TO THE FUTURE! My favorite knob twiddlers (besides Joe Meek and Brian Eno) are traversing the globe once again, bringing us the finest mechanized sounds from our daily lives. Kraftwerk, the android Fab Four electronically transform everyday noises and sounds from outer space to formulate a strange and beautiful music. Honking, swerving automobiles, clicking Geiger counters, clanking trains, ringing telephones, beeping calculators, talking robots, whirring bicycles and interstellar sound waves become the soundtrack to our journey. Over the years, Techno music beats grew faster and faster until they became one big rave. But you don’t need to be high for Kraftwerk (which formed in the 1960s – long before Techno) to take you on an out-of-body experience with their often travel-themed musical excursions. Out of the sludge of early 1970s Prog Rock came Kraftwerk from Germany. Their streamlined formula of simple melodies with steadfast driving electro beats has endured. There’s nothing warm and fuzzy about them, yet somehow there is an endearing quality to their music. Humanity could not be repressed. After all, it is humans who make the machines sing! Kraftwerk’s live shows are nothing but fahr’n fahr’n fahr’n! The first note sounds, and it is as if something like P-Funk’s Mothership has landed. Strangely enough, Kraftwerk are just as funky! The curtain is lifted, the magnificent Spacelab comes into view, the K-machine is cranked, and away we go – until somebody presses the ‘off’ switch two hours later. Bits of beautiful melodies float upon repetitive beats and phrases sung with vocoder vocals. Kraftwerk picks up the metronomic pace just a smidgen and the whole place rocks out. We were handed cardboard 3-D glasses, which couldn’t be more retro! An occasional robot pops off the screen, a spaceship swerves by, ‘Numbers’ swirl around our heads, the ‘Trans Europe Express’ train speeds directly at us, out of a black night. ‘Airwaves’ twist and oscillate. Cool expressionist graphics and nostalgic films really pop. Space-travel imagery along with graphics of everyday objects float and swirl in monochrome, or in bright neon colors transcending their original applications and meaning. Factoids about the rate of release of nuclear radiation flash onscreen during ‘Radio Activity’. The deceitful beauty of this eerie yet simple melody from 1975 bears an ominous lyrical warning of a soon fulfilled prophecy. A 3-D flying saucer lands during ‘Spacelab’. A geometric monochrome ‘Metropolis’ is quite impressive. Mercedes and VWs drive on the classic ‘Autobahn’. Their rear view mirror images are also in 3-D. The size of the ‘instruments’ shrinks over time. Each band member now stands at a desk console – a sleek and classy presentation. This is a far cry from the gigantic cumbersome synths and machines they transported from their Kling Klang studios in Dusseldorf back in the 70s. The only original member is co-founder Ralf Hutter, but that is not important. The new members seamlessly carry on the mechanical legacy of Kraftwerk. “It’s good, but is it rock?” was the critical reaction to Kraftwerk’s groundbreaking Autobahn album. They could literally walk away and the music would never stop…but they are performing – operating switches, knobs and faders. Hutter, at far stage left plays live keyboards and vocals/vocoder. Hitpert plays live keyboards, Schmitz manipulates effects and electronic percussion and Grieffenhagen synchs projections with basic tracks. (Original founding member Florian Schneider left the band to research synthesized speech). The clean-cut band members always looked old-fashioned, especially now. Yet they wear neon-ribbed leotards, illuminating their unearthly exoskeletons. Their robotic presence is sometimes broken by a cracked smile or human gesture, when scanning the diverse bespectacled audience of Hip-Hop, Techno, House, Disco and Rock fans. The ornate 1930s United Palace Theater (sometimes used as a church) was a seated venue, which kept the crowd much more subdued compared to other Kraftwerk shows. The lengthy ‘Tour De France’ coupled with the 2003 version created a lag in the otherwise brilliant show. Absent were the band’s robot replicas, which usually perform the encore. Perhaps they were detained at airport customs in Montreal last night. 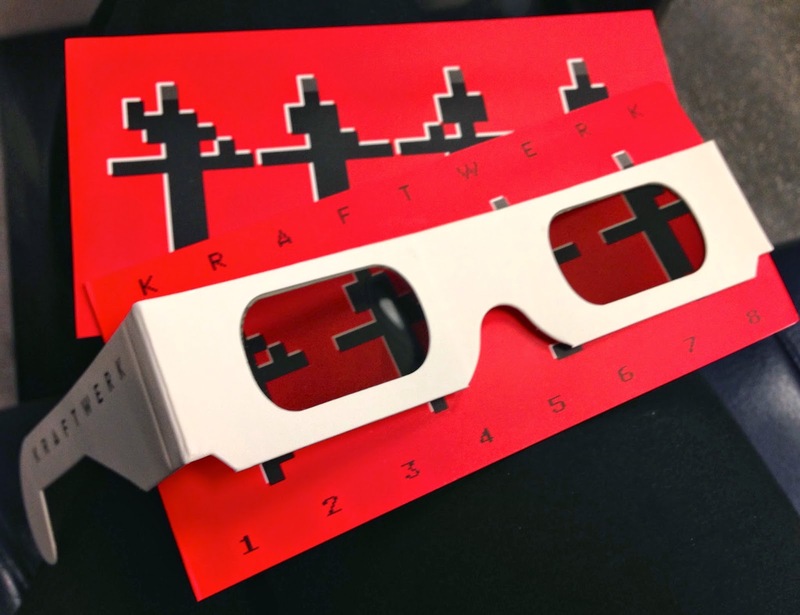 ‘The Catalogue 12345678’ live concerts of 2013 (and currently continuing) feature selections from one of eight Kraftwerk albums each night at prestigious venues and museums. The show at New York’s Museum of Modern Art in 2013 was not considered a concert, but a ‘curated retrospective’. ‘The Catalogue 12345678’ has since been performed at Akasaka Blitz in Tokyo, the Tate Modern in the UK, Sydney Opera House and most recently at L.A.’s Walt Disney Concert Hall in March. It will be performed in Vienna in May. Most unfairly, these 60-minute performances sell out immediately to VIPS and celebrities. The real treat is seeing a full two-hour concert with selections from the band’s entire catalog. When I played Kraftwerk tapes in the 70’s at my job in a department store, a customer complained that the weird music was scaring her baby! Now tickets are in high demand. Kraftwerk was awarded a Lifetime Achievement Grammy this year. Kraftwerk’s precise, deliberate music has influenced a multitude of diverse artists including the first electronic disco song, Donna Summer’s ‘I Feel Love’ (by German producer Georgio Moroder). You can hear it in Blondie’s ‘Heart of Glass’. David Bowie was infatuated. New Wave bands of the 1980s; Ultravox, Depeche Mode and The Human League were disciples, as were Joy Division / New Order and Japan’s YMO. Kraftwerk’s beats and melodies (‘Numbers’ / ‘Trans Europe Express’) were first sampled on Afrika Baambaata’s proto Hip-Hop ‘Planet Rock’ (1982). Coldplay, Radio Head, Fergie, Madonna and Jay-Z are also borrowers. But still, nobody does exactly what Kraftwerk are doing.